In a chilled mixing bowl, whip the whipping cream and powdered sugar until stiff peaks form and the mixture holds its shape. Refrigerate until ready to use. Place the bread cubes into a large bowl...drizzle with the melted butter and gently toss. Transfer to a rimmed baking sheet and bake, stirring occasionally, until the bread just begins to color, about 12 minutes. Cool. Spray a 11"x7"x2" glass baking dish with the non-stick cooking spray. Using a whisk, blend the whipping cream and 1 c. of the caramel sauce* in a medium saucepan over medium heat until bubbling. Remove from the heat and cool slightly. Whisk the eggs and yolks together in a large bowl. Add the rum, vanilla and salt. In a slow drizzle, whisk in the warm caramel mixture. Stir in the bread cubes, cover with plastic wrap and let soak 30 minutes, stirring occasionally. 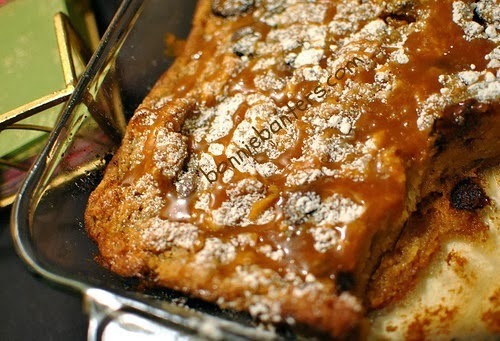 Drizzle with about 1 c. of the remaining caramel sauce and sprinkle with the powdered sugar. Serve warm with the whipped cream. Store leftover pudding in the refrigerator. This pudding is great cold or warm...individual servings can be gently reheated in the microwave. Cut or tear the crust into about 1" pieces and place on a foil-lined baking sheet that has been sprayed with the non-stick butter-flavored cooking spray. Spray the pieces of bread with more of the cooking spray and toast, stirring occasionally, until golden brown. Turn the oven off and remove the croutons until the oven has cooled down a little. Return the pan of croutons to the turned-off oven and leave for about 15 minutes, or so, to become firm. Store in an air-tight container...preferably tin. I make croutons like this from other bread crusts and occasionally, for seasoning, sprinkle with Mrs. Dash seasoning blend or other dried herbs. Spray your utensil(s) with the non-stick cooking spray. Also, to use that last drop of your precious caramel sauce, pour some hot coffee or hot chocolate into the jar for a nice caramel-flavored hot drink! 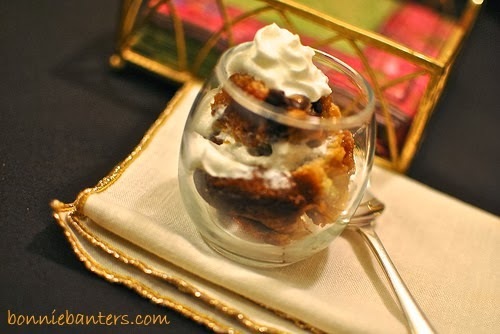 Take this decadent caramel pudding to the Valentine party and they'll love <3 you for it! Enjoy! Pinned to my Dessert Board! I'd be very afraid I could eat this whole pan myself!! Better save it for company...it would definitely be a crowd pleaser!